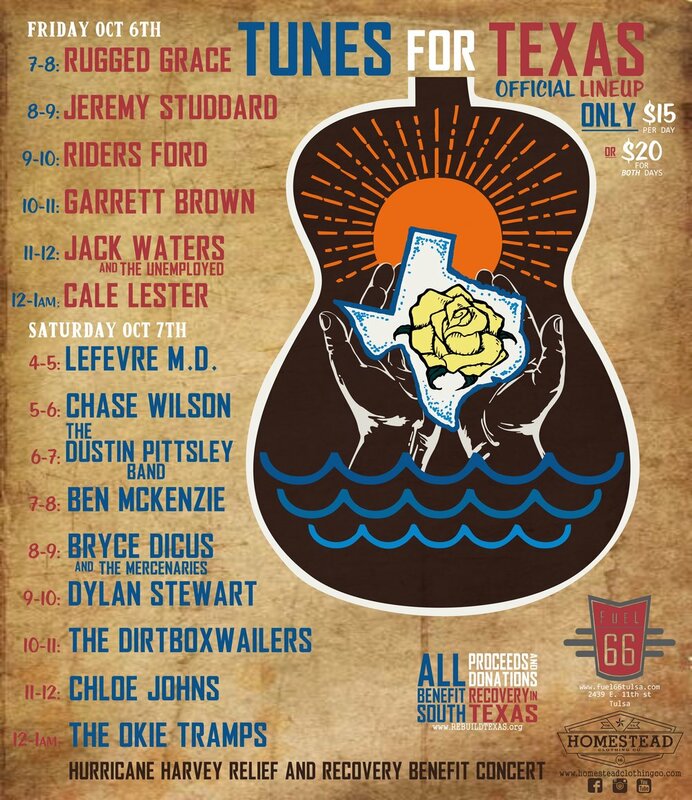 TULSA, Okla. – Following the devastating effects of Hurricane Harvey, local musicians are coming together Oct. 6 and 7 to raise money for recovery efforts. Fuel 66 and Homestead Clothing Co. are partnering to host Tunes for Texas, a two-day benefit concert at Tulsa’s premier food truck park. The all-ages event begins at 7 p.m. Friday and Saturday at 4 p.m.
Friday’s lineup includes Jeremy Studdard, Garrett Brown, Rugged Grace, Jack Waters and the Unemployed, Cale Lester, and Riders Ford. Saturday’s lineup features Bryce A. Dicus and the Mercenaries, The Dustin Pittsley Band, The Dirtboxwailers, The Okie Tramps, Dylan Stewart, Chase Wilson, Ben McKenzie, Lefevre M.D., and Chloe Johns. Tickets cost $15 per day or $20 for both days. They can be purchased online at www.Fuel66Tulsa.com, www.homesteadclothingco.com or at the door. All proceeds will go to the Rebuild Texas Fund, which was launched Sept. 1 by Michael and Susan Dell with an initial $18 million. To date, the fund has generated more than $44 million from nearly 14,000 donors. For more information about the fund, visit www.RebuildTexas.org. Homestead Clothing Co was born out of that same red dirt spirit as the music that found its way across Oklahoma and Texas with roots spreading throughout the world. Products are all designed and produced in the heart of Broken Arrow by red dirt enthusiasts with a passion for not only the music, but the lifestyle. For more information about the clothing brand, visit www.homesteadclothingco.com. Fuel 66 opened in the fall of 2016. It is open Tuesday through Sunday and features a full bar that offers more than 60 beers. It is a kid-friendly and dog-friendly environment that hosts various food trucks each day. Fuel 66 is located at 2439 E. 11th Street. For more information visit, www.fuel66tulsa.com.